Don't forget to save this date--Monday September 1, 2014--for the Annual Askin Boulevard Block Party. If you can help spread this information it will be awesome! Please see an article below from the Windsor Star about the upcoming Sandwich Fest. The Sandwich Town BIA is asking for gently used donated bikes for kids in need in the west-end. Please spread the word. This is a great initiative. 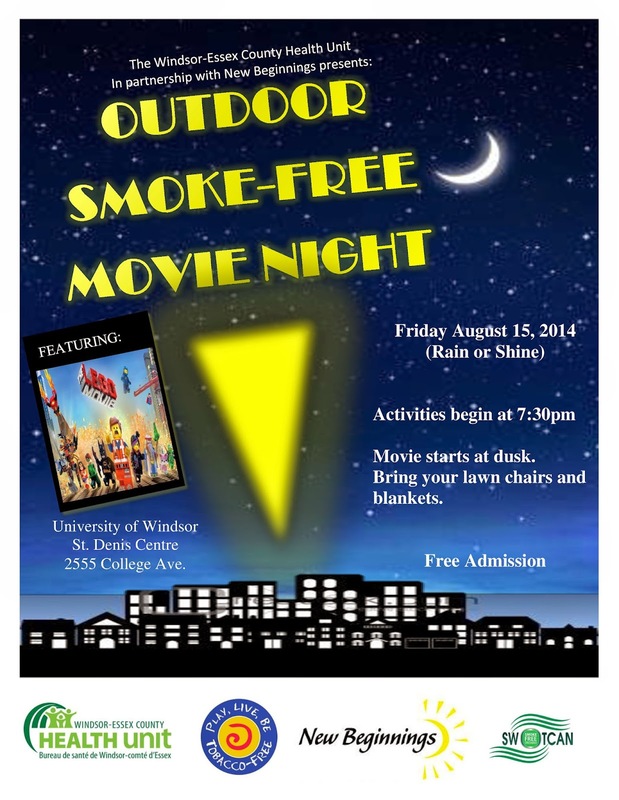 New Beginnings Outdoor Smoke-Free Movie Night! Please see an email I received form our good friends at New Beginnings. This looks like a great event. Please spread the word and let's get as many families and youth out as possible. "Hi Fabio, We are partnering with the Health Unit to advertise this great free smoke-free movie night at the St Denis Centre Friday August 15th. It is going to be playing on the stadium field, or inside the field house in case of rain. Activities begin for kids at7:30 and the movie will start when it gets dark enough. All are welcome! It will be a great family night under the stars J If you could post this to your blog and spread the word around, that would be awesome. Thank you,"
About WWSR The Windsor Westide Reunion is an organization dedicated to the growth and development of the West-End community in Windsor, Ontario. I received the following email from a west-end resident who wanted to share that the park at the foot of Mill St. is being actively used and is a positive space for the neighbourhood. "Fabio, a big accomplishment in Sandwich Town is that so many people go down to the park at MIll Street. I took it upon myself for the last six years, with the help of others, to keep the area clean and the grass cut down to the river so that hundreds of people can enjoy the area. If you go down there you can see that the grass has been cut right down to the river. It makes it more attractive for visitors, dog walking, fishing, walking etc. I also had the no parking signs removed from Mill St. by the park so people have somewhere to park. This brings a nice, clean family atmosphere. This is just my thoughts." I received this from the Director of Development at the John McGivney Children's Centre (JMCC). The JMCC is located in the west-end and could use all the support we can give. Be a Super Hero! Click on the link above for the upcoming ‘Super Heroes’ Run! Proceeds to benefit JMCC!